The fishing village of Asilah, south of Tangier, has become a popular seaside resort because of its nearby Paradise Beach, relaxing ambience, and picturesque, 15th-century, Andalusian medina, which extends to the sea wall. 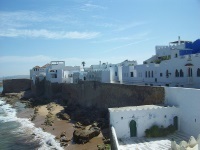 Asilah is characterised by picturesque white buildings reminiscent of Santorini, but with a dash of Moroccan flavour. The town has a long and fascinating history, dating back to 1500BC, and it was not always as peaceful as it is now: in the 19th and 20th centuries Asilah was a notorious base for pirates, and from 1912 to 1956 it was occupied by the Spanish. The ramparts and gateworks designed to fortify the old town against invaders of old are still intact. Getting around Asilah is easy enough, with feet being the best mode of transport, although donkey carts are also a fun option. Asilah is accessible from Tangier by train and coastal road, and this easy accessibility contributes to its popularity with tourists wanting a break from urban Morocco. Asilah is fairly quiet for most of the year, except when artists and performers descend for the Asilah Arts Festival each August. The resort town hosts several arts and music festivals, including a mural-painting festival which ensures that the town's walls remain covered in striking paintings all year.